Brosix provides users with unlimited in terms of size and quantity peer to peer file sharing. For information on how to send files, please see this tutorial. 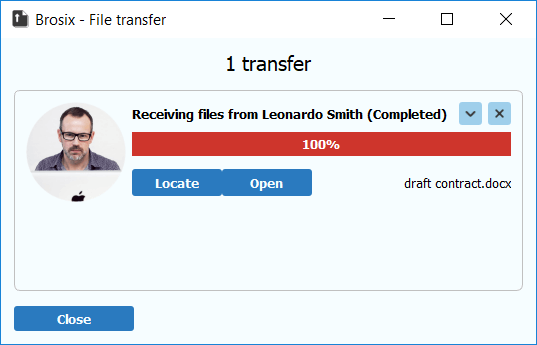 Once you choose to save your file, the “Brosix- File Transfer” window will launch where you can see the status of the transfer. 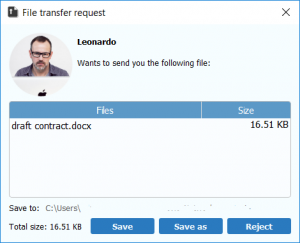 Brosix allows you to scan incoming files after integrating your preferred anti-virus and malware software into the Brosix app. Once set up, this feature allows you to scan all files that you receive through the app. 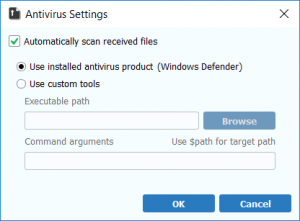 You can set up the Anti-Virus Check in few simple steps. Please note that this feature is deactivated by default for new users, and they will need to activate it. You can integrate the anti-virus software of your chose by clicking on the “Brosix” menu and selecting the “Settings” option. From the “Settings” window select the “Plug-ins” option and double click on the “File Transfer” plug-in. 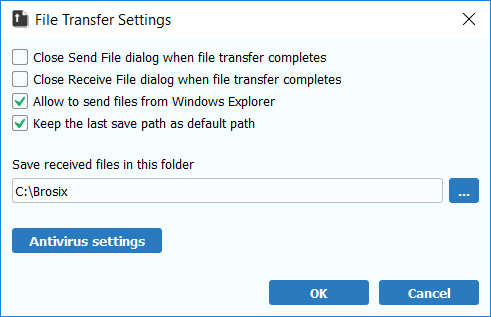 The “File Transfer Settings” window will now open, where you will see a range of different features related to file transfers. From here you can select whether to close the send and receive dialogue boxes after files are transferred, allow the sending of files from Windows Explorer, save the last save file path, and chose your preferred destination for saved files. In order to complete the process of integrating your anti-virus software, click on the “Anti-virus settings” button. You will see that upon opening this window, the Brosix app has automatically recognized the anti-virus software on your computer and selected the option to “automatically scan received files.” If you would like to select a different software, select the “use custom tools” option and locate your preferred software through the “browse” option. Once you have selected your desired settings, click the “OK” button and exit the window. Your anti-virus software will now automatically scan all incoming files that you receive through the Brosix app.